Is this the most expensive chess board in the world? Microsoft launches new games and fun apps for Surface PC - is this the now the most expensive chess board in the world? 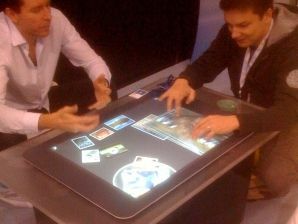 Microsoft has recently launched a number of new games for its touchscreen Surface PC. The virtual chess and checkers board in the game is a fully accurate recreation of a real-life chess and checkers game – perhaps the closest we have got to date to the dream of the Star Wars' style holo-chess! Which prompts us to speculate – how long until Microsoft develops Surface PC to make use of fully 3D holographic characters and icons? We've asked the Microsoft Surface PC research team, but we don't expect to be hearing back from them for some time! "We've recently made available a group of sample applications for our Microsoft Surface customers as a download on our Community site. These applications are targeted at hospitality and entertainment venues." The games include a rather cool-looking multiplayer block/tiles moving game (think touch-Tetris meets touch-Lumines!) and a basic and fun painting app. Registered customers for the Surface PC can head over to the site to learn more if they so wish.